Mazda Motor Corporation announced at the Los Angeles Auto Show* today it will offer the SKYACTIV‑D 2.2 clean diesel engine in the all-new Mazda CX‑5 for North America from the second half of 2017. It will be Mazda's first diesel engine model in the North American market. Mazda Motor Corporation announced at the Los Angeles Auto Show* that it will offer the SKYACTIV‑D 2.2 clean diesel engine in the all-new Mazda CX‑5 for North America from the second half of 2017. It will be Mazda's first diesel engine model in the North American market. The SKYACTIV‑D 2.2 to be fitted in the all-new CX‑5 for North America provides a torque-rich driving experience and revs freely to high RPMs. It will meet the region's strict emission standards and make the all-new CX‑5 one of the most fuel-efficient vehicles in its class. The engine also adopts Natural Sound Smoother and Natural Sound Frequency Control, proprietary technologies that reduce diesel knock sound for a quieter and more pleasing sound. "We're confident this engine offers a smart new option for North American drivers who want both performance and fuel economy," said Akira Marumoto, Mazda's Executive Vice President and Representative Director. 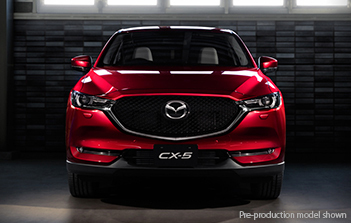 By providing driving pleasure and outstanding environmental performance to all customers, Mazda aims to enrich people's lives and become a brand with which customers feel an emotional connection.